Are your clients stuck in dead-end jobs? Something better is out there—and you can help them find it. Breathe new life into your clients’ careers with the SDS. The theoretical foundation of the SDS is as strong as ever. 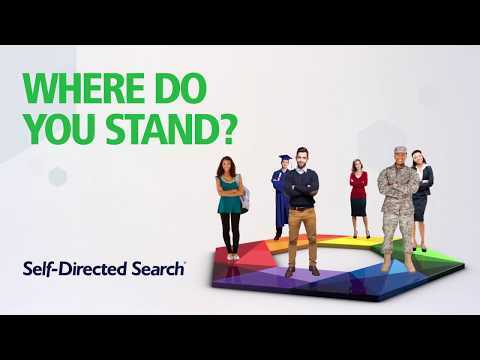 Based on John Holland’s theory that both people and work environments can be classified according to six basic types, the SDS uses the RIASEC model as a framework for your clients’ process as they consider the personality characteristics, interests, aspirations, and competencies that will guide them to a rewarding career. The SDS does not require any special training or certification and can be used by school counselors, career development facilitators, education specialists, and career professionals. To learn more about the development of the revised SDS materials and reports, view this NCDA 2018 presentation. Learn more about integrating RIASEC theory with cognitive information processing (CIP) theory in the Handbook for Using the Self-Directed Search: Integrating RIASEC and CIP Theories in Practice. Interested in an online group account? Those who administer the SDS frequently should consider a group account, which offers discount pricing for multiple online administrations. To learn more about group accounts, see our group accounts and partnerships flyer. Learn more about available print products for the StandardSDS and the StudentSDS and order online quickly and easily. Click here Opens in new window to purchase group accounts and help your clients find out where they stand!